The 2013 Mount Rushmore Silver Bullion Coins by the United States Mint are the last of five 2013-dated strikes of the Mint’s America the Beautiful Silver Bullion Coin® Program and honors Mount Rushmore National Memorial of South Dakota. 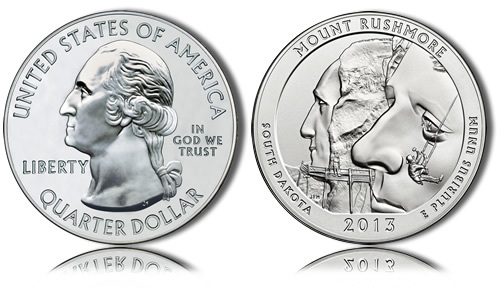 The Mount Rushmore Coins have a listed release date of November 4, 2013. As with all of the strikes in the series, this Mount Rushmore Silver Bullion Coin is minted from five ounces of .999 fine silver to a diameter of three inches. Designs found on this strike are similar to that of the Mount Rushmore Quarter, which is no accident. When Congress authorized these silver bullion coins, it required them to contain the same images as found on the associated America the Beautiful Quarters® Program. This includes an obverse with a portrait of George Washington and a reverse emblematic of the selected site of national interest – in this case, Mount Rushmore National Memorial. This series of silver bullion coins is designed for investors and, as such, will not be sold directly to the public by the US Mint. Instead, the Mint will use its network of authorized purchasers like it does for all of its bullion products. This network obtains the coins in bulk from the Mint, then resells them in smaller lots to the public for a small premium above the current spot price of the precious metal contained within them. Since these Mount Rushmore Silver Bullion Coins are based on the similar quarter dollar, they will only have a face value of twenty-five cents associated with them. This amount is relatively trivial compared to the coin’s melt value, however. A coin’s melt value is based on the amount of precious metal it contains. As such, since these silver bullion coins are struck from five ounces of the precious metal, they will have a melt value approximately equal to that amount of silver on the open market. Finally, some collector’s may want to add some of these coins to their collection which could give them an enhanced numismatic value. This numismatic value is the price which a collector would be willing to spend on the coin and typically increases based on the coin’s perceived rarity and its condition. When issued, the Coin Sales Page will show current sales information for the strikes as well as current melt values. As previously mentioned, these Mount Rushmore Silver Bullion Coins contain designs similar to the associated America the Beautiful Quarter. As such, its obverse will showcase John Flanagan’s portrait of George Washington. This image of the first President of the United States has been in use on the quarter dollars since 1932. "The reverse design was inspired by photos of men who are adding the final details to Thomas Jefferson’s face. Mount Rushmore was featured on three 1991 Mount Rushmore Golden Anniversary Commemorative Coins and on the 2006 South Dakota quarter issued under the 50 State Quarters® Program. This new design is distinctly different and offers a unique and educational perspective on how Mount Rushmore was created and sculpted. Inscriptions are MOUNT RUSHMORE, SOUTH DAKOTA, 2013, and E PLURIBUS UNUM. The reverse was designed and executed by United States Mint Sculptor-Engraver Joseph Menna."